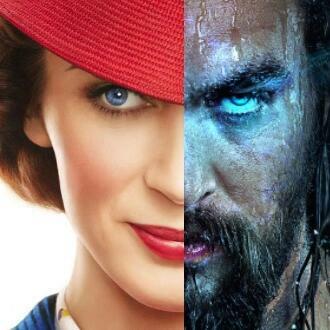 The year is ending with a bang, as Aquaman, Mary Poppins Returns, and Bumblebee all hit theaters for the holiday season. One, an enormously charismatic hero with the ability to communicate on a deeper level with every living being while simultaneously saving lives. The other two, Aquaman and Bumblebee. On this special episode, we explore each of these three behemoths and their respective plots and details. First up, we trip a light fantastic as we sashay into Mary Poppins Returns! Emily Blunt picks up the umbrella and returns to theaters just in time to put that stoic narcissism and delightful penchant for a song to the test and save the Banks family from certain ruin. Joined by Hamilton star Lin-Manuel Miranda, Blunt grasps ahold of Mary Poppins and makes it her own, but does it live up to the original? Poppins, music, insanity, and family - we explore a world of imagination as Aaron and Amanda discuss Mary Poppins Returns. Next, Bumblebee. Set in 1987, Hailee Steinfeld stars as Charlie, a young girl who has recently lost her father and her inner light. She’s a mechanic like her dad, and she’s desperate to repair her father's car when frustration leads her to an old bug. Which happens to be Bumblebee after his unfortunate voice incident. The two become fast friends before having to fend off both an irrational government, and a pair of rowdy Decepticons dead-set on information Bumblebee has on Optimus Prime. Lastly, we dive into DC's latest hero, Aquaman. Born a son to an underwater Queen (Nicole Kidman) and a human, Arthur Curry learns he is destined to rule the underwater kingdom of Atlantis. Along the way, he must challenge his brother Orm, and fend off the villainous Manta. For this section, Aaron is joined by John Davenport and Brian Williams to debate Arthur Curry's journey towards his rightful place as King, Jason Momoa's entry into the DC Universe, Amber Heard's hair, Patrick Wilson's flair, and James Wan's direction. 2019 Update | Vote for the Annual HO Awards!